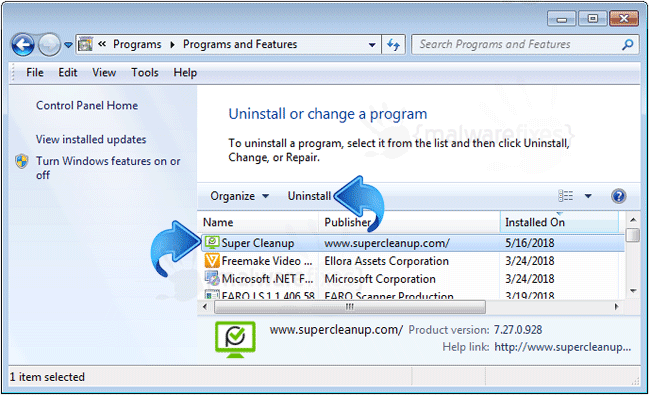 Super Cleanup is an illusory PC maintenance and optimization program made to run on Windows operating system. Computer security experts found this as rogue tool that aims to swindle money from nave victims. 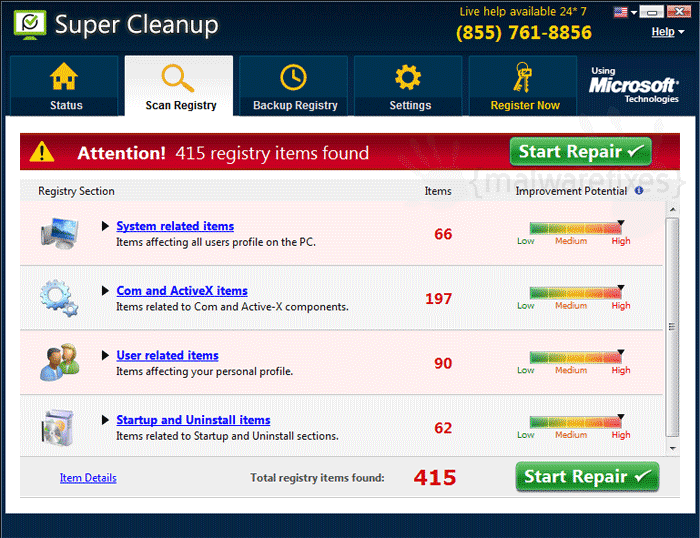 It is obvious that Super Cleanup is just a variation of so many pretentious tools including Reg Tuneup, Mac Purifier, and many more. As always, rogue program like Super Cleanup is using deceptive technique to be installed. Most of the time, it is utilizing fake web page scanner that hijacks browser programs. Web page content is filled with various warnings and alerts that induce visitors to download a copy of Super Cleanup. Obviously, worried web user is left with no option but to adhere to instructions to obtain and install the program hoping that it is the solution to resolve displayed warnings. Once Super Cleanup installed a local copy on user’s computer, it immediately initiates a full scan. As seen on the image below, the program will issue errors involving system files, Com and ActiveX items, and Startup objects. The display of these registry errors is another way for Super Cleanup to scare victims. Hence this time, it will advise users to purchase the full version of the program. It is clear that it wants user to spend for this doubtful and useless application. The real solution to this issue is to remove Super Cleanup itself. For a complete guide to clean the computer, see the special section on this page. Thoroughly scan the computer with virus and malware removal tool as instructed to ensure complete removal of Super Cleanup and relevant malicious objects. 2. Add/Remove Program window will open. Select Super Cleanup from the list. 5. The tool will start scanning the computer. It will prompt when it finds Super Cleanup and other malicious entities. Follow the prompt to proceed with the removal. 3. After downloading the file, Windows will prompt that download has completed. Click Run to start scanning for Super Cleanup . Another option is to browse the location folder and double click on the file to run. 5. Next, you will see Scan Type. Please choose Full Scan to ensure that all Super Cleanup entities and other harmful files left on the computer will be found and removed. For advanced computer user, you can opt for Customized Scan, if there are other drives or folders you wanted to include in this scan. 8. When removal procedure is complete, you may now close Malicious Software Removal Tool. We hope that Super Cleanup have been completely deleted from the computer. Please restart Windows to proceed with the normal operation. 6. Next, click on Threat Scan. This is the most comprehensive scan method that will surely find any hidden items linked to Super Cleanup.